By insisting on deep time and naturalism, and by denying special creation, proponents of atoms-to-astronomer evolution have developed many problems for their paradigms. One that should stop them in their tracks at the onset is the faint young sun paradox. (It is a paradox because it does not fit their belief system.) Essentially, way back yonder, billions of Darwin years ago, the earth would have been too cold after the after the supposed Hadean time (think Hades, as in, "Hotter than the hubs of") to let life evolve because the sun was not strong enough to provide ample warmth. Since these owlhoots dug themselves into a hole about the age of the earth and evolution, they conjured up some excuses. Two of these are the "solar belch" speculation, as well as the solar flares guesswork. Now they have a new horse in the excuse corral. An attempt to marry up impacts on Earth with greenhouse gasses to seal in Earth's heat fails on several levels. Scientists do something frequent: ignore other possible explanations for what has been observed. They also didn't utilize their education on basics of geology and other sciences. A problem here is how they build assumption upon assumption, fallacy on fallacy, and have a castle in the sky that has no value. (Then Evolution's True Believers™ troll the web and pass fantasies like this along as "science". If you dare to think for yourself, you are a liar and a "science denier" because evolution.) Quite a bit of tap-dancing in order to deny that the evidence really supports recent creation. Also, quite a bit of blind faith in materialism. The ‘faint young sun paradox’ is considered in relation to theories on the early earth and a new proposal regarding Earth impacts. 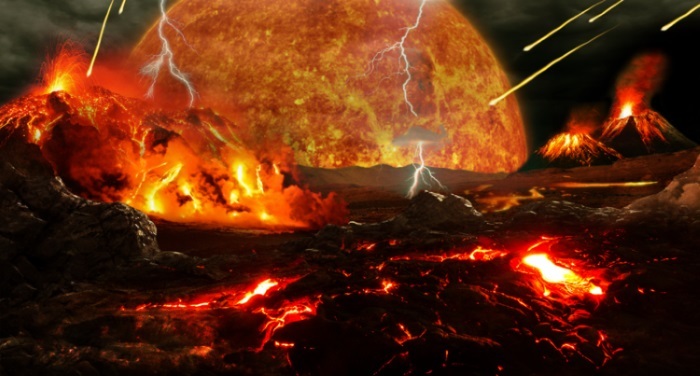 This proposal is that large impacts could produce greenhouse gases for millions of years that would help solve the problem of the evolution of life under the young sun. The concept dovetails with proposals that large impacts could stimulate volcanism. Problems with this concept are considered in relation to the time-scale of the faint young sun problem. It is shown that the new proposal is overly optimistic regarding impacts affecting greenhouse gases and that the outgassing effects in any case would only be present for a small portion of the time in which the faint young sun issue exists. If you've taken a shine to reading the rest of this rather technical article, click on "Earth impacts and the faint young sun".